CURRENTLY PLAYING IN CINEMAS WORLDWIDE!! A Mad Max Movie without Mr. Mel Gibson? The Mad Max series started way back in 1979 and titled wouldn't you know it Mad Max with the then unknown Mel Gibson who plays Max Rockatansky. It takes place in a future where natural resources are running out and society is breaking down. The usual dystopian future that's nowhere near apocalyptic since Max is a police officer. It takes place in Australia but where most of Australia now looks like the outback instead of big cities like Sydney or Melbourne. Lots of open space, open roads and stuff. No tall buildings. The story is sort of a cross between the Punisher and Judge Dredd. Cop who acts as judge, juror and executioner loses whole family then goes on revenge. The sequel showed up in 1981 and was called Mad Max 2 : The Road Warrior. In this one, Max has been wandering the wastelands for awhile fighting raiders and such when he runs out of fuel and plans to steal some from a small commune but instead of stealing it he ends up defending it from other raiders and marauders. The third installment showed up in 1985 and was titled Mad Max Beyond Thunderdome this was the one that also starred Tina Turner and who also song the main theme song of the movie that became a hit on its own. Max is still wandering around the wasteland when he runs out of supplies and ends up into a town where the leader of the town Aunty Entity sends him on a task in exchange for what he wants but instead of doing what she wants he discovers things aren't as they seem and goes back to her to tell her he doesn't like it. Also there are orphans there who think he's their savior. In the end Aunty Entity is taken down and the orphans are saved. They end up somewhere else while Max continues wandering the desert. Honestly, I can't remember any of them and even reading about them to write this review doesn't bring back much. Maybe I saw them maybe I didn't. Does it matter? Nope. At least I don't think so. The plots are simple and from my reading of them it isn't about the plots, it's about what happens on screen. This most recent one (AND HERE'S THE PART WHERE I MAY HAVE SPOILERS, SO PLEASE SKIP THIS PART IF YOU HAVEN'T SEEN IT. AND SEE IT YOU SHOULD. ACTUALLY THE SPOILERS COULDN'T POSSIBLY RUIN IT FOR YOU) starts basically like the other sequels. Max played by Tom Hardy is still wandering the desert wasteland but this time you see him haunted by his past, literally. He sees things and reacts to them. What does he see? Well, I'm not going to ruin it for you. So as he's staring off into the distance dealing with the voices in his head and chewing on a two headed lizard he just stepped on he hears a rumble in the distance. It's a band of raiders called the Way Boys. He shifts gear and tries to escape them but they catch up to him and take him to their citadel. The citadel is home to their leader King Immortan Joe (Hugh Keays-Byrne). There, while still unconscious, he is tattooed with a few details including his blood type and then branded. He wakes up halfway through this and tries to make his escape but fails yet again. Meanwhile, the citadel is about to send a convoy out to the neighboring towns to pick up more fuel and ammunition. The convoy is lead by Imperator Furiosa played by Charlize Theron. Unbeknownst to Immortan Joe, Furiosa has more than just fuel in her tanks. 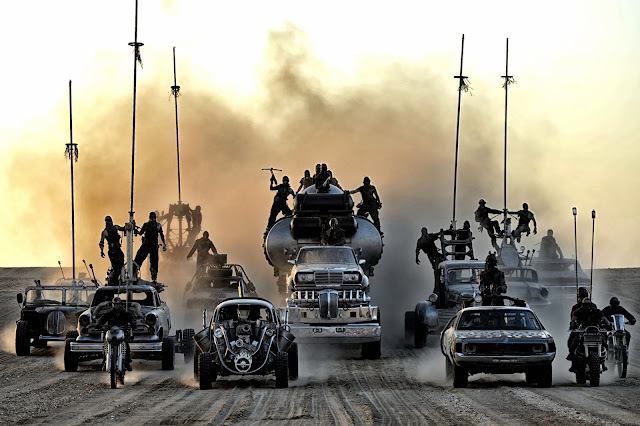 As the convoy proceeds towards the first pit stop Furiosa makes a sudden detour but since none on her convoy questions her much they just follow along but back at the citadel they are being watched and this sudden change in direction begins to alarm Immortan Joe, immediately he goes off to check on his possessions, his harem of beautiful women. He finds them gone. He immediately calls for his War Boys to chase after her. 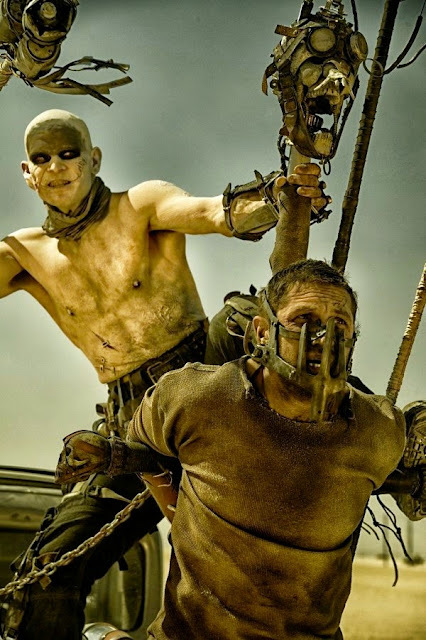 While Furiosa was executing her plans to save Immortan Joe's harem girls or as Immortan Joe calls them breeders, Max was having his blood drained right into a War Boy named Nux. As the War Boys are preparing to mount their chase Nux is almost left behind due to his condition (the reason why he's getting a blood transfusion) but he fights his way back into the chase team with Max now conveniently called blood bag tied to the front of Nux's car. 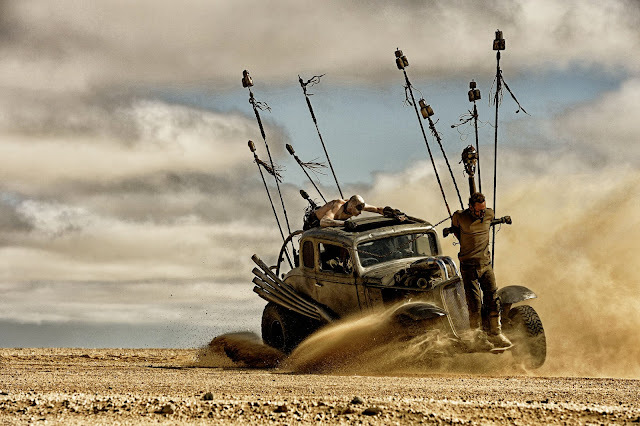 They Immortan Joe and the War Boys catch up with Furiosa while Furiosa and her convoy are battling another group of marauders. All hell breaks loose and things are blowing up and bodies are flying everywhere. When the lead team from Immortan Joe catches up with them her convoy catches on that something's not right and that she may have done something very bad. 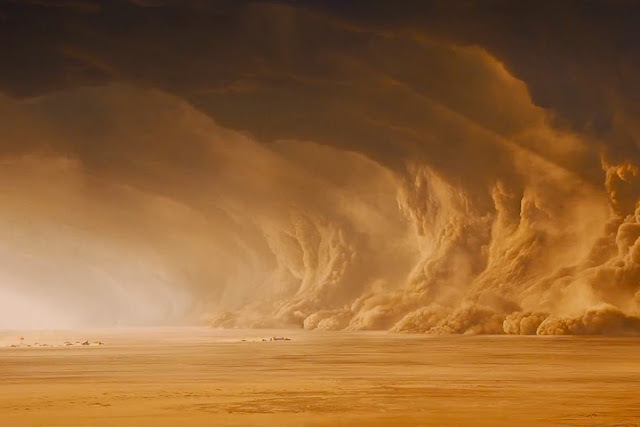 As Immortan Joe and the War Boys start to gain ground on Furiosa a furious sand storm shows up. Furiosa makes straight for it along with a few War Boys but Immortan Joe and the rest hold back. In the storm there are huge tornadoes whirling with fire and lightning and most of the War Boys that follow her in are killed save for Nux who by this time is driving alone with Max holding on in the back. As Nux closes in on Furiosa he floods the inside of his car with gasoline and lights a flare to turn his car into a moving fire bomb. Max manages to grab his hand before he lights the fuel but the car goes tumbling knocking everyone out. When Max comes to he's still tethered to Nux and while he's trying to cut the chains he hears noises in the distance. He grabs Nux and the car door that somehow is tied to them as well and heads over to the noise. It's Furiosa, her truck has been bogged down by the sand. He creeps up to them and manages to surprise them. He gets them to cut his chains with a bolt cutter and is about to steal their truck when it doesn't start. Furiosa has rigged the truck to start using a special sequence. As they talk they hear Immortan Joe in the distance. They come to a truce and make their escape. They head towards a canyon and drive in. It's a narrow pass with high rock walls on either side but before they drive in Furiosa informs everyone that no one but her can be seen in the truck. So the girls hide out under the cab and Max goes in with them. As they begin their drive in Nux shows up attempting to stop them. He's been hiding in the back of their tanker. But he fails again. He runs back towards the coming War Boys and they pick him up when he says to Immortan Joe he's been on Furiosa's truck trying to stop her. In the canyon Furiosa meets with her contact but the deal goes sour when they hear Immortan Joe's group in the distance. They make their escape and now they're being chased by Immortan Joe and the her betrayed contacts. They make it through the pass but lose one of the girls they were trying to save. Immortan Joe struck with grief holds back but his brothers continue the chase as they have vested interest in his harem. One of the brothers split off to chase after them into the dark of night but they end up dead courtesy of Max. The next day the escapees find themselves in open desert where they spot a tower in the distance. As they close to it they hear someone yelling for help. Furiosa recognizes it for what it is. A lure. But she heads on out towards them alone and starts speaking. She identifies herself by her old group. Turns out the trap was laid out by women from her past. Now the escapees and Furiosa long lost extended family team up. She also finds out that her old home no longer exists, so they plan their next journey. Max decides not to go with them. As Furiosa and the rest leave him behind Max changes his mind. He chases after them and when he reaches them he lays out his plan. His plan, to head back to the citadel the way they came back through Immortan Joe and the canyon and pass it before him and then block of the passage. When they reach the citadel it'll be defenseless as Immortan Joe will be stuck in the canyon with all the War Boys. The battle to pass the canyon is insane and Immortan Joe ends up dead. Nux sacrifices himself to make sure the canyon pass is blocked. 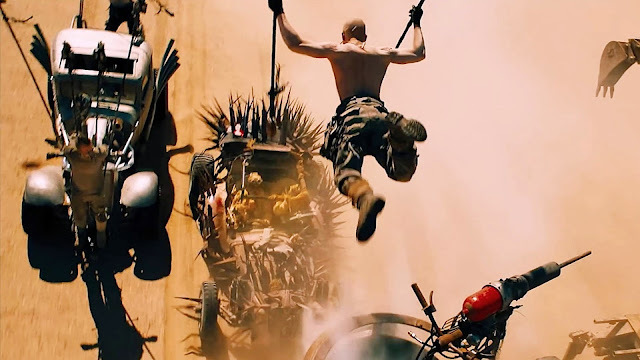 When they reach the citadel the remaining crew of Immortan Joe are clueless as to what to do next when Max drops Immortan Joe's body in front of them. As Furiosa and the rest are welcomed by the populace, Max slowly slips away to continue wandering the desert. If you think you've seen an apocalyptic future in a movie, wait till you see the one in this. It'll blow your mind! As I mentioned before I can't remember much about the first three Mad Max movies and reading up on them didn't help me remember much. Maybe I didn't watch them. But the one thing that didn't pop up much was how the movie looked, how it was visually. I of course like most of you have seen the trailer to this one and of course was very much impressed by what I saw in those few minutes but honestly speaking the trailer does not do it justice. In fact, you'll probably notice that trailers these days sometimes show you the best parts of the movie and when you eventually go watch it you end up feeling a little disappointed, right? Well, let me tell you the trailers for Mad Max: Fury Road does not do that. When you sit down in that cinema to watch the whole things you are in for a hell of a ride. The visuals are incredible. Everything you see on that screen is amazing. The scenery, the sets, the costume, the make-up effects, the cars, it's all just amazing. This was the first movie that left me thinking, 'Now that's a f*&ked up future...' A lot of movies have tried to make a depressing looking future or a violent future but George Miller has nailed it with this one. It was just incredible. Then there's the actual story which for all intents and purposes isn't all that original but it's how it's told that really impresses. There's little by way of dialogue. A lot of the story is told through gestures and facial expressions but in no way are you left thinking that this movie suffers from it. In fact, if there were anymore dialogue than it already has it might have made the movie feel a little draggy if not a run of the mill action movie. Which makes the acting done by the main cast so incredible. Charlize Theron was especially amazing. And then we come to the action scenes. If you thought you'd seen the most incredible actions scenes involving cars in the Fast and Furious series then wait till you watch what George Miller has in store for you in this one. It's rumored that almost all of the action scenes were done without CGI but as you sit there you head is thinking there is no way they didn't use CGI because some of them were just incredibly bonkers. This is an action movie that puts a lot of action movies I've seen recently to shame. It really does. And with the action comes the violence. The violence in this movie is just off the hook. There's just so much of it. Every action scene has explosion, crashes, close up shootings, bodies being flung from vehicles or being run over it was just ridiculous and coupled with the way all the characters look you would think that this wasn't happening on an earthly wasteland but in hell. It was just gruesome looking characters battling in the most extreme way possible. Doing anything to get what they want. And that's where I'm going to put a little caveat. If you don't like violence don't go watch this movie. Seriously. Each second of this movie is a look at a violent and dismal world. There's nothing pretty about it. Everything is surreal and bleak. And when I'm talking about violence I'm not talking about what you saw in the Fast and Furious series or the Marvel movies or movies where you see the main hero shoot people in the head. 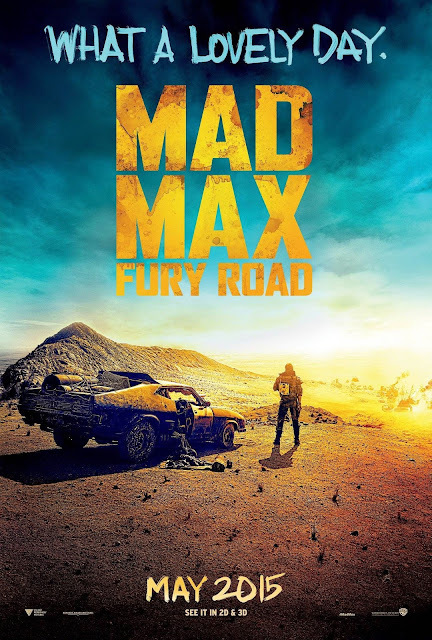 Mad Max: Fury Road takes all of those and turns it up to eleven. At the end of the movie I felt a little overwhelmed. It's a movie unlike any other I've seen of late. In fact, come to think of it I don't think I've seen anything like it except for in anime and not surprisingly George Miller was inspired a little by Akira. 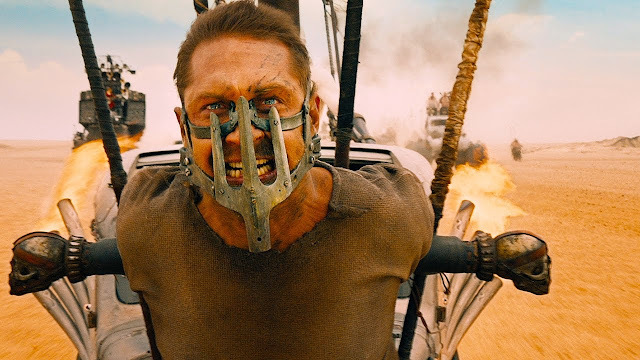 No western director has put on screen a violent future like the one George Miller has with Mad Max: Fury Road. No one has made action scenes like he has in this movie either. If you're not afraid of a little extreme visual violence then go give this a chance. If you are afraid still give this a chance because if you don't you'll miss a movie that people will talk about and probably copy in years to come. There's rumor that when Mr. Miller shot this movie he ended up with enough for two movies and also that he has ideas not for two Mad Max movies but four and that Tom Hardy has signed on for all of them. I for one will be looking forward to watching all of them just to see how George Miller will top himself. If you're an action movie fan then you owe it to yourself to watch this. Forget everything else you haven't seen and go watch this first. I guarantee after watching this you'll see action scenes a little differently. Especially scenes involving cars. I give this movie a solid 4 out of 5.